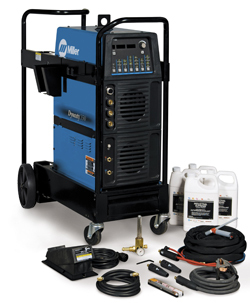 Miller Dynasty 400 amp AC/DC Tig Welder, complete ready to weld water cooled package. Latest technology - this powerful, AC/DC inverter delivers superior arc performance with total AC arc shaping capabilities. Auto-Line™ technology allows connection to any voltage or frequency in the world while using half the power of a conventional welding machine. AC TIG Features Independent Amplitude/Amperage Control allows EP and EN amperages to be set independently to precisely control heat input to the work and electrode. Extended AC balance (50–99%) controls the amount of oxide cleaning (amperage time in EN) which is essential for high quality welds on aluminum. AC frequency (20–400 hz) controls the width of the arc cone and the force of the arc.. Programmable start parameters allow independent starting conditions based on process and memory selections (amperage, time and polarity). High-frequency arc starter for non-contact arc initiation. Lift-Arc™ start provides AC or DC arc starting without the use of high frequency Auto-Postflow calculates the length of postflow time based on the amperage setting. This eliminates the need to independently set the postflow time for different amperages. This feature preserves your tungsten and prevents porosity. TIGRunner® packages feature a 3.5 gallon (13.2 L) cooling system. The cart is equipped with cylinder carrying capabilities, filler rod holder, foot pedal holder, torch and cable holders. A pullout Drawer provides additional storage for torch consumables and tools. Package includes Miller Dynasty 400 power source, Miller Tigrunner, Miller coolmate 3.5 water cooler, Undergear/trolley, choice of Tig torch to suit your needs earth lead, regulator, flow metre and Miller RFCS 14 foot control unit .